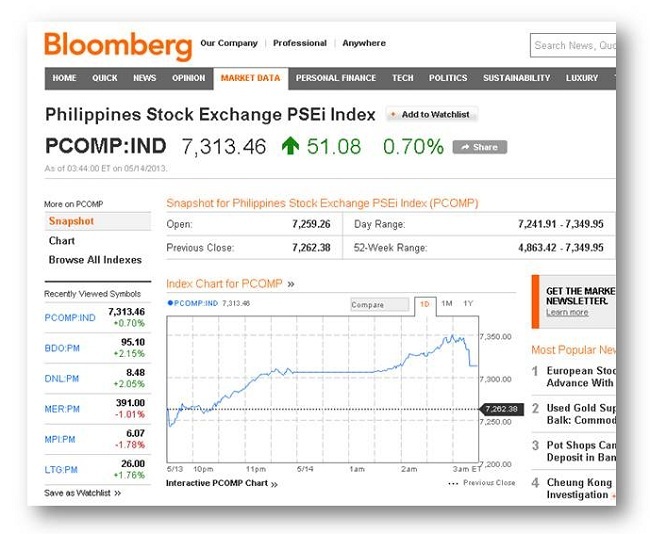 Philippine Stock Exchange Index (PSEi) Breaks The 7,300 Mark, The 30th Record High This 2013. We hit another new record, breaking the previous Philippines Stock Exchange Index record just last Friday. From 7,262.38 last May 10, 2013, now crested to a new record, hitting the 7300 barrier. So... what can you say about that? 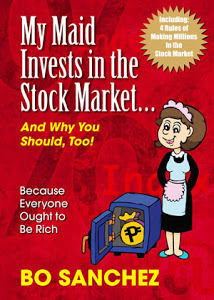 Honestly, because of this bullish-positive-market trend, some investors cannot buy stocks anymore. They say it's so expensive. They say... they cannot select any good and deserving companies anymore because, they're running out of companies to buy. I really thank Bro Bo for putting up his Truly Rich Club, in this kind of situation we will no longer guess what companies to buy. That's one of the many benefits of being a member of the Truly Rich Club. out of companies to buy. Thankfully, our "very strict" and "very conservative" Mentor has okayed _,_,_ and _,_,_ for our purchase. You can buy _,_,_ until it reaches our Buy-Below-Price of P_,_,_. Now, for the news about the Philippine Stock Exchange Index (PSEi) Breaks The 7,300 Mark, The 30th Record High This 2013, here's a latest update from rappler.com. Please also read. 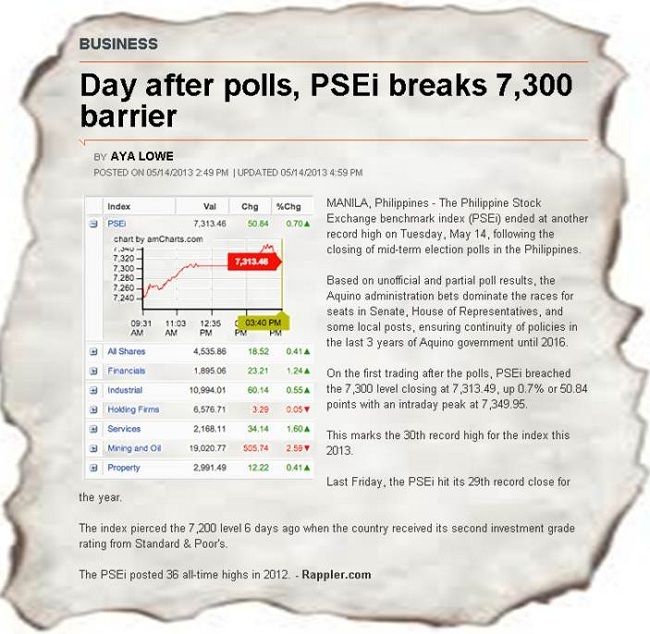 "On the first trading after the polls, PSEi breached the 7,300 level closing at 7,313.49, up 0.7% or 50.84 points with an intraday peak at 7,349.95. 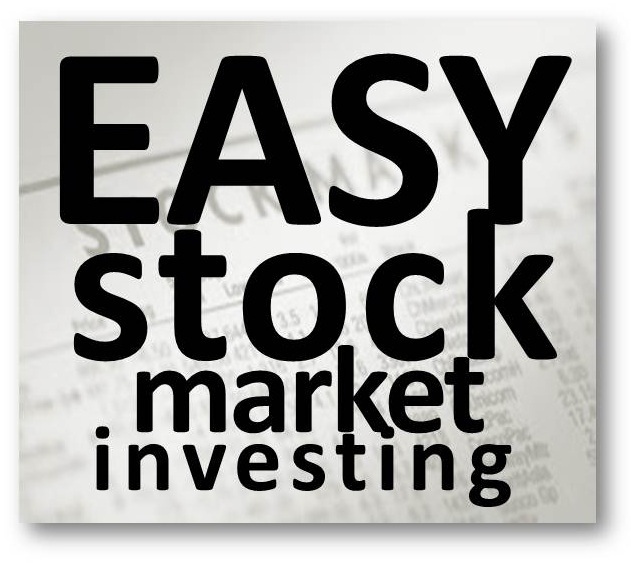 This one is good news for those stock market enthusiasts like me, I think I will be able to trade some of Philippine Stocks on my binary trading. I will check on 24option review http://www.our24optionreview.com if the bullish trend will continue in the PSI. And I hope it does so I can get profit. Thanks, LangBee01...but this is not always the case. Sometimes it goes down too and since we're following TRC SAM rules, we don't have to worry when it goes down.